PEARL, MS -- The Southern League of Professional Baseball Clubs announced its 2016 Post-Season All-Star Team earlier today. 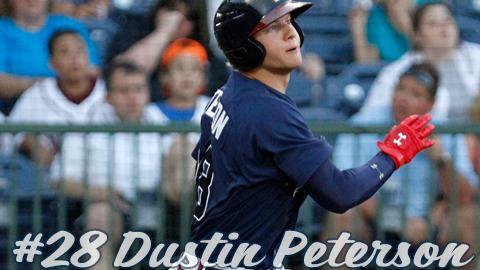 Outfielder Dustin Peterson was the lone Mississippi Braves player named to the team this season. Peterson ranks seventh among Southern League leaders with a .280 average on the season. He leads the league in at-bats (500) and doubles (36). He also ranks tied for second in hits (140) and extra-base hits (49), third in RBI (83) and fourth in games played (126). The outfielder was also selected as a Southern League Mid-Season All-Star earlier this year and was named Southern League Player of the Week twice. He posted his best numbers during the months of July and June, hitting .345 and .320 respectively. Peterson also holds a .361 average with two outs and runners on base. Peterson entered the 2016 season ranked by Baseball America as the Braves No. 22 prospect. The Arizona native was acquired by the Braves as part of a six-player deal with San Diego that sent Justin Upton to the Padres in December 2014.